Westbury Total Health Care specializes in Complex Lymphedema Therapy in Nassau County, New York. Our Physicians have 50 years combined experience treating hundreds of complicated Lymphedema conditions. I can tell you from using it, the results are great. We use it in conjunction with CLT and compression bandaging. In some difficult cases when started to use the tape it helped to advance the results. The tape works by lifting the skin and allowing the lymphatics underneath to drain., Staff at Westbury Total Health Care. The idea behind the tape is to lift the skin and allow the lymphatics underneath to drain from the area, we continue to perform the CLT to open channels so that the load to the lympathics is reduced. Depending upon the severity, chronicity and degree we usually perform the compression bandaging as well. In mild cases sometimes the CLT,tape, and garments are all that is needed. 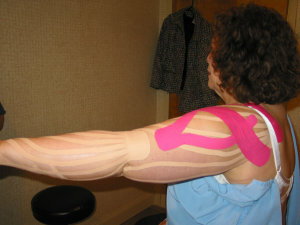 The Kinesio tape Association is world wide and has been around since the late 90's. It became very popular after the recent Olympics when the top athletes were using it for womens volleyball, basketball and Lance Armstrong for cycling. / General Purpose of taping:/ Kinesio Tape is designed to gently create forces on the surface of the skin which elevate the tissue, relieving the pressure beneath the skin surface, thereby promoting increased circulation. 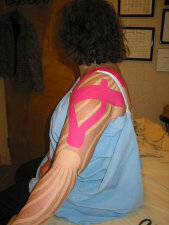 / Wearing of the tape / Kinesio tape is to be worn for appx. 2-4 days. The tapes cotton fabric will absorb water; however the acrylic glue adhesive next to the skin is waterproof. The tape is perforated with numerous holes to allow air circulation, making the tape comfortable to wear./ The tape may be worn in the shower. Please DO NOT rub the tape with a towel or washcloth. DO NOT use hair dryer to dry the tape. Blot the tape with towel; the cotton fabric will dry in approximately 20 minutes. / When putting on clothing, try not to rub against the tape excessively as this tends to roll the edges of the tape. If a section of the tape should begin to peel, simply trim the affected portion with scissors. / Observation / If any itching sensation develops beneath the tape, remove the tape immediately. A small percentage of people are sensitive to a salt build up trapped under the tape. If you continue to wear the tape, skin irritation may result. / Handling the tape / Please remove the tape approximately 24 hours before your next therapy visit. Inform your therapist about any changes that occurred after the tape was removed. To remove tape, pull in direction of hair growth. Use a trailing finger under the tape, separating the skin from the tape. Soaking the tape in water (in the shower) helps with its removal.